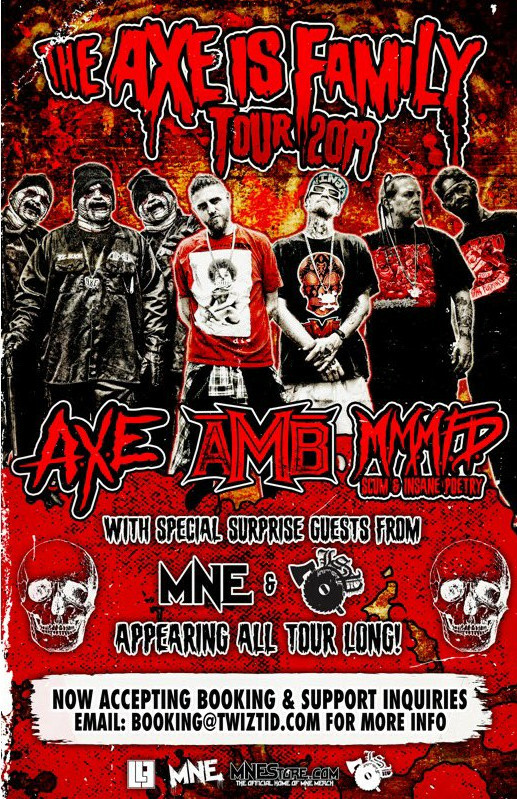 News > Underground News > The Axe Is Family Tour featuring AXE, AMB, and MMMFD: Now Booking! 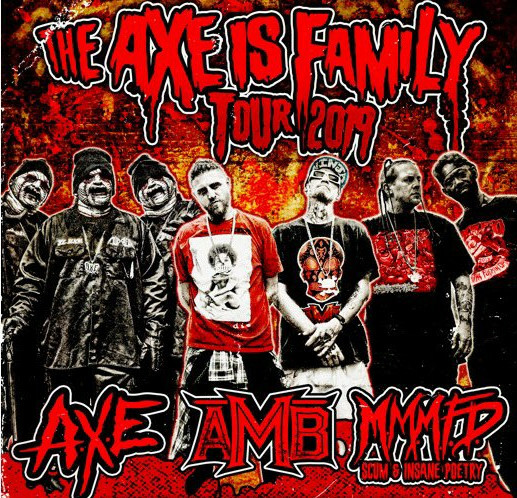 The Axe Is Family Tour featuring AXE, AMB, and MMMFD: Now Booking! We’ve heard rumblings about the upcoming The Axe Is Family Tour for weeks now. It’s coming to a city near you early next year! Not only that, but at select spots along the tour, there will be special surprise guests from both MNE and LSP all tour long! Are you an artist looking to get onto one of these shows? Are you a booker/promoter looking to bring this tour to your city? Then hit up Booking@twiztid.com to talk business! Wonder whatever happened to AMB’s “Grind N Shine Tour”. Guess them going out by themselves doesn’t muster enough interest. Anyway, if this stops by me I may check it out, also depending on what MNE artist is going to show up. Should be called the Acronym tour, with special guest Otis the back stabbing snake. Hopefully they add a few Canadian dates, that’s a solid triple bill. A.X.E. 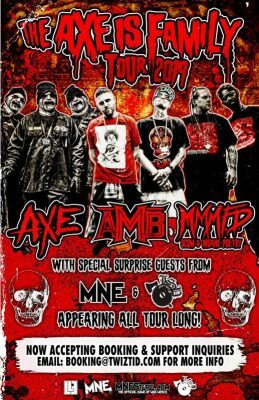 and MMMFD were dope on the Fright Fest tour, and I’ve never gotten to see AMB, so that would be dope if it hit my area. AXE disappointed me in Chicago for Fright Fest unfortunately, but there music is dope so I would go again. MMMFD was awesome, haven’t seen AMB yet but bump their stuff and YW solo. Show should be solid. See y’all mafukos in Denver ! I’ll go see this for sure if it comes close. Assume AMB gets the headline spot? You’d think but since it’s more than likely A.X.E.’s tour they’ll be before A.X.E. and after M.M.M.F.D. HES WORKED WITH 3 6 MAFIA. ALSO HE PRODUCED INSANE CLOWN POSSE. YOUNG WICKED WORKS WITH PLATINUM ARTISTS. Clown posse vs. Halloween costumes? That’s significant comments on their music/lyrics.